We offer up to fourteen font style options per engravable item. You may enter characters A thru Z, numbers (i.e., 1,2,3,4,5,6,7,8,0), and special characters (!,@,#,$,%,&,*, ( ), _, +, accents, tildes, etc.). If your keyboard does not allow you to enter a special character then please type your personalization instructions in the special requests step. View our Font Style Selection Tips section for tips on selecting the best font style option. 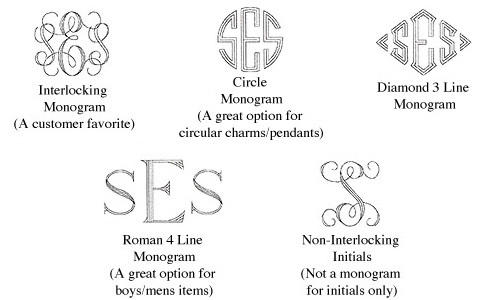 We offer five monogram sytle options. The non-interlocking initials option is for use with initials only - as all letters engraved will be the same size. You may enter characters A thru Z. Numbers and special characters are not offered with our monogram style options.